I'm honored to know you, fellow members of the WolfGang. My ambition is validated and fueled by your impassioned hearts. You are a readership, more so a community, that's unique to my story. From our exchanges via social media to your participation in my events and initiatives, you are a dedicated and active constituency representing a larger idea. My work is all about you. I embarked on this journey with the purpose of devoting myself to people and preservation. Mozart only truly lives on through the actions we take as audience members, musicians and scholars, but even more powerful is the shared human experience which is sacredly and sustainably Mozart. This is The Chronicles. In gratitude and recognition, I invited readers to submit a short entry along with related media about their relationship to Mozart and The Chronicles. I received submissions from nine Mozartians in the United Kingdom, Brazil, The Netherlands, Sweden, Canada and the United States. Although they represent only a fraction of the individuals I've met through this platform, they offer a profile of the true character of my readership. They are unique, diverse and immensely passionate. Meet the WolfGang! Mozart’s music, has, to me, always seemed so wonderfully, magically and poignantly real: it is alive, imbued with a sacred understanding of the human condition that transcends culture, context, history and place. When I listen to the way the bass instruments breathe achingly through the Clarinet Concerto in A or aurally revel in the Act 2 finale of Figaro, in which myriad disparate voices are fused in one blistering synthesis of pure, infectious harmony, my heart swells in profound awe. My mind, in turn, conjures up a contented image of the humble maestro, cloaked in a crimson pelisse and quietly moved by the immense honour his magical musical continues to bring. It is this human Mozart, this radiantly magical, egalitarian music that Modern-Day Mozartian so beautifully and carefully preserves. It is a sincere honour and privilege to be involved in a community where one is able to share in such sacred genius: where the excitement and thrill of discovering a new published literary work or a new musical piece is so thoroughly and completely understood. 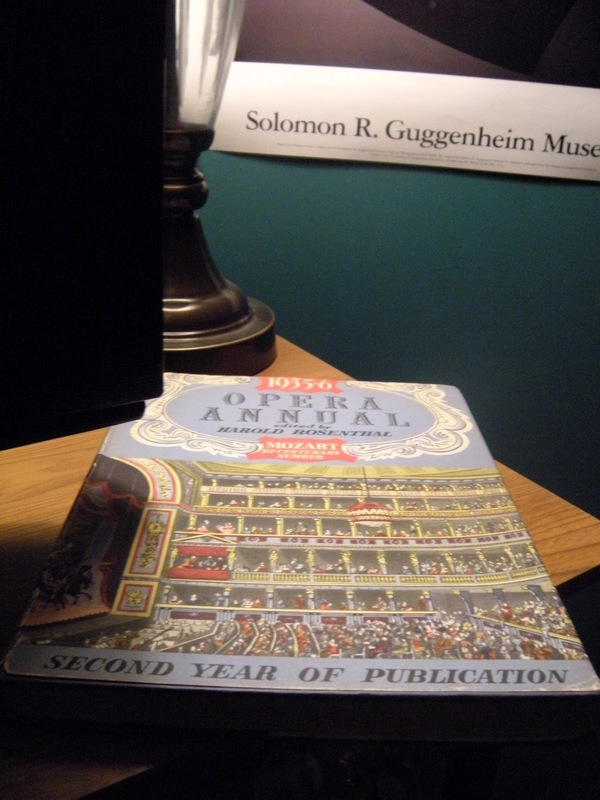 It is wonderful too to be able to read each informative blog entry or interview here presented, filled as they are with revelations, surprises and facts, lovingly and diligently presented, that my humble heart may advance but one step closer to Mozart the man. Were I bold enough to speak on behalf of dear Wolferl, I think he would be very proud of the Modern-Day Mozartian project and all it means to achieve. It promotes and preserves ideas which seemed especially close to his own heart: love, tolerance, fraternity, joviality, and humanity, but, most important of all, the pure and impassioned love of music. 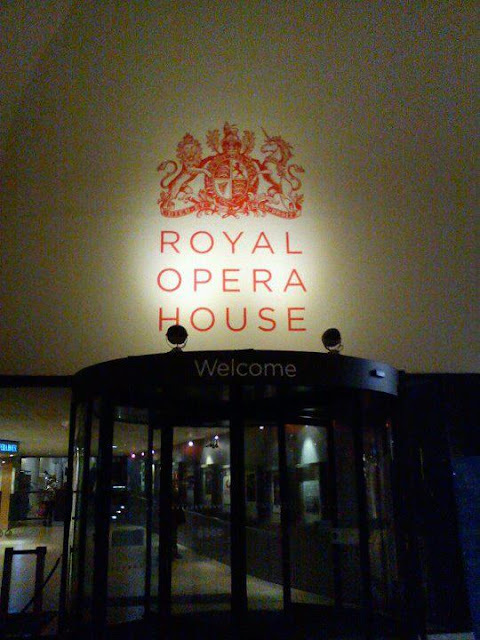 *The following are photos Tori shared from the first Mozart opera she attended, Don Giovanni, at the Royal Opera House in London on February 3, 2012. 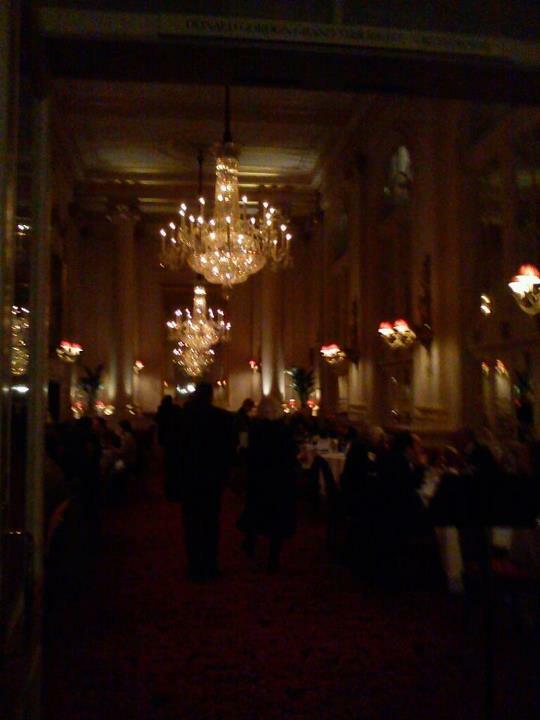 Her caption: In these opulent surroundings I felt so unworthy and out of place. As soon as Mozart's music started though, my soul was transported home. Passion is an infectious thing. When one encounters someone with genuine, heartfelt passion for anything - a person, a place, a work - one cannot help but be swept up by the force of that passion as well. Sherry's passion for Mozart - manifested in her fantastic blog - has been invaluable in helping me rediscover a passion for the Classical music I grew up playing, and in cultivating a deeper appreciation for the innumerable ways in which Mozart forever enriched the world of music - and the world as a whole. Now, when I fire up iTunes, I find myself gravitating toward Mozart more often, and I am now able to experience his music more joyfully thanks to Sherry, as I have learned much more about the man who created it. Thank you, Sherry, for your passion, for a great blog, and for your tireless efforts to keep such amazing music alive in hearts worldwide! *This is a photo of the Mozart bicentenary edition of the Opera Manual that Del was kind enough to surprise me with in May! Del is a teaist (tea expert!) so he especially enjoyed listening to the BBC Mozart podcast that I sent his way about the tea chest Mozart carried with him on his travels. Like everyone on this planet, I had always known about this composer called Mozart and that many people seemed to enjoy his music a lot, but I never had the motivation to seek him out. That was until I came across Sherry's page. I can't recall whether it was the blog or the Facebook page I got acquainted with first, just that her style of writing made it all seem so fun, young and cool that I had to check it out and see what this guy really was about. Maybe I should add that, for over 20 years, I only owned music albums by Michael Jackson and Michael Jackson ONLY. After discussing Mozart's life and work with Sherry through Facebook and emails, and reading her blog entries, I went on to purchase my first "best of" Mozart album and since then, I'm hooked. I've been reading books on him and even found the inspiration in the mystery of his appearance to make a drawing, which I now have on my living room wall. What inspired me to draw him as I did were the many paintings of him that I had looked up online as well as those Sherry shared with me. Of course, I based mine on the family portrait by della Croce, but I made my version of him with softer facial features, just as I see him. *This is Monica's original artwork that she completed and unveiled in August. Very inspired! My own journey with Mozart occurred early, in the sixth grade. I had started clarinet a year before, and through clarinet lessons, I began to play transcriptions of Mozart duets with my teacher. In high school, college and medical school, my passion for Mozart's music began to extend to a fascination about his life and medical illnesses. 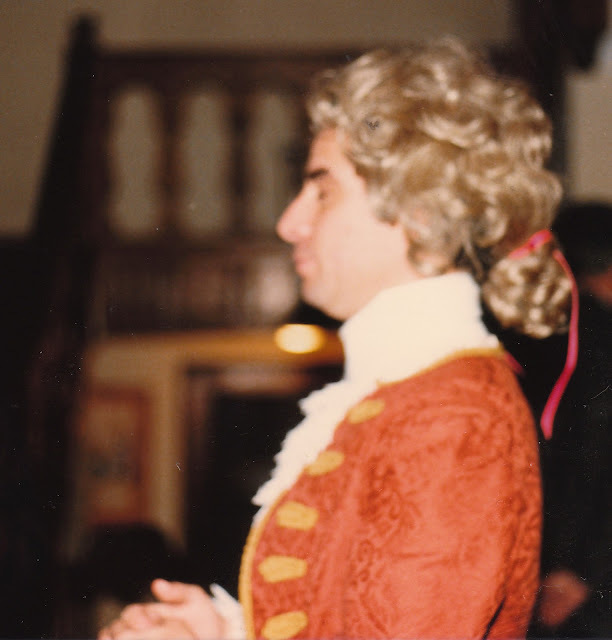 In 1991, I organized and performed at The Connecticut Mozart Festival, a thirteen-concert Festschrift to the composer and his music, and got to play the Concerto, quintet and trio. Over the years, I have done lecture-recitals and written some papers and essays, exploring Mozart, his chamber music and operas, the Mozart effect and the legacy of Mozart in our own time. I will participate in a Mozart Requiem performance in the fall. It has been a wonderful journey with this most sublime and enigmatic of composers. You are a star, Sherry! 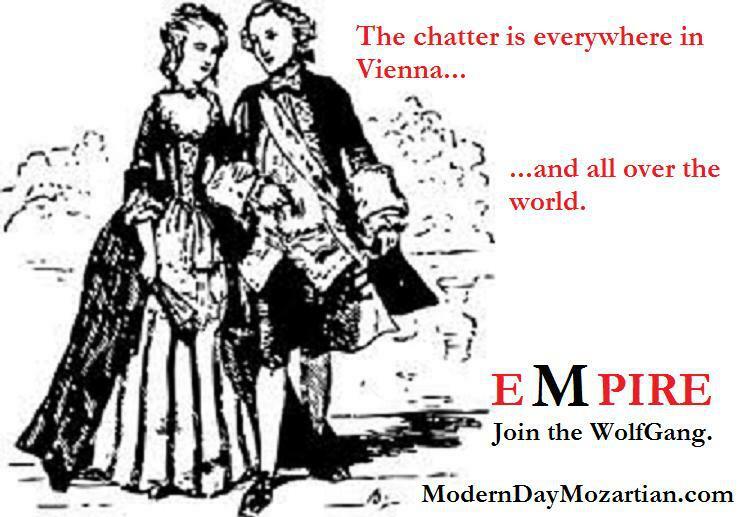 You have found a way to keep the flame of Mozart's genius alive and vibrant, and a way for many of us in the worldwide Mozartean community to remain both connected and engaged. Brava, Sherry, brava! You are the curator of Mozartiana, a modern-day Schauspieldirektor of all things Mozartean, the head chef of cuisine called "Everyday Mozart," the preservationist of Mozartean lore, a meticulous revisionist who constantly strives to put the truth about Mozart and his accomplishments as epicentric in our daily discourse, and the bringer of essential relevance to our times of a genius who died tragically young 221 years ago, before his work was done. You make Mozart essential, foundational, living. Thank you. *The following are photos Vincent shared from November 1985. His caption: I was almost 34, almost Mozart's age at the end of his life. 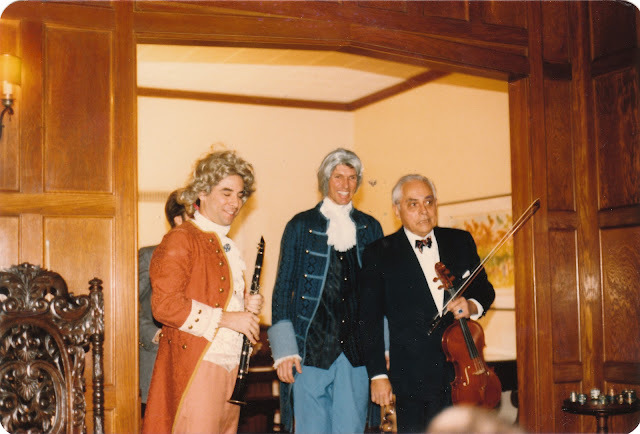 The group photo is myself as Mozart on clarinet, Professor Stuart Gillespie of the Dept of Music at Naugatuck valley community college as Salieri on piano and then Conductor of the Waterbury Symphony, Maestro Frank Bried on viola for the so-called but misnamed Kegelstatt trio, KV. 498. It was misnamed “Kegelstatt” because it was the horn duos KV. 487 that were composed in the skittles alley by WM, not this delightful trio. I have loved Mozart since I was a child and read his letters and sang his operas for a long time. I went to Salzburg and walked about his birthplace in tears. For years I was a classical singer, and performed Despina, Susanna, Papagena, Zerlina, and even one terrifying performance of the Queen of the Night in many small opera groups in New York City and in many concerts. Eventually I started an opera company for the sole desire to perform Sesto in La Clemenza di Tito; I translated it myself. The tenor Francisco Casanova loved my translation and said, "You're a good singer, but you're really a writer." He went on to sing on major stages internationally and I turned to writing novels. It was only natural I write one about Mozart! Marrying Mozart, about Mozart and the four musical Weber sisters (one of whom he married), was my fourth novel published and through it I came to know Sherry, who has been a major influence on my Mozart life. I met her through her website when she reviewed the novel. Shortly after, she gave me an e-mail introduction to the director Phil Grabsky and his documentary In Search of Mozart. Sherry came to New York City where we helped launch the film at its debut in the famous Mostly Mozart Festival at Lincoln Center. She then organized a small Mozart event in Athens, Ohio (where she was born) and brought me out to speak about my novel. She has visited me a few times in NYC (sometimes with her sister) where they have stayed at my house and we have haunted Mozart productions at the Metropolitan Opera in some of the best seats and some of the very worst, where we were almost hanging from the very top side balcony trying to catch a glimpse of the stage. Last autumn, she introduced me to the Mozart Society of America and arranged for me to speak in Minneapolis at their conference which is attended by international scholars. Sherry is someone who brings people together through music. This December, my Mozart novel will have its premiere in NYC as an opera -- a singspiel/pastiche, an original play by two gifted authors featuring several professional NYC singers with orchestra...music by Mozart, of course! I am expecting her for another visit where we will go to one of the performances and then after stay up very late in our pajamas, talking about...well, you guess! Could it be a composer from Salzburg? *Stephanie's celebrated novel, Marrying Mozart, has been translated into eight languages and optioned for a film, for which we're still keeping everything crossed! I've listened to Mozart's music ever since I was in my mother's womb. The love for his music has been in my family for generations. But when I started to touch the piano keys with my own fingers and I learned to play some pieces like Fantasy in D Minor KV. 397, I became completely impassioned ... I was around 9 years old. And the passion grows until today. How can you listen to the Great Mass in C Minor K427 without falling on your knees? It's too magnificent!! To find The Chronicles of a Modern-Day Mozartian was a great joy for me. It keeps me updated with quality information and most importantly, I LEARN A LOT! I just would like to say Thank You, Sherry, to be so devoted and to share your knowledge about this genius that was Mozart with so many people. You really do a great job and with a lot of sweetness! *The following is an image from my Amadeus entry to which Maria felt a connection through her admiration of the film. Amadeus is responsible for bringing many Mozartians into the fold! To paraphrase Joseph Haydn, composer and friend of Mozart, "They'll be no one like Mozart for a hundred years." Others have said a thousand. I say we will never see anyone the likes of Mozart. He was like a comet that passed in the night sky so briefly, and was gone in an instant. But his music lingers on. Music of such beauty and depth that transcends all things physical and lifts one's spirit up to universal heights. 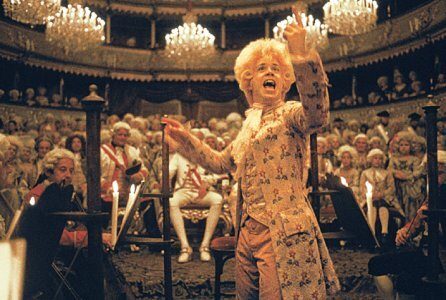 I have become more than just a fan of Wolfgang Amadeus Mozart. I have become a fanatic of his work. I devour all I can hear, read and see about him. And thanks to Sherry and her Chronicles website, I know where to go to quench my thirst for all things Mozart. May this short paragraph express my thanks for the never ending work that she does and may she never cease. Bravo, Sherry! Molto grazie! 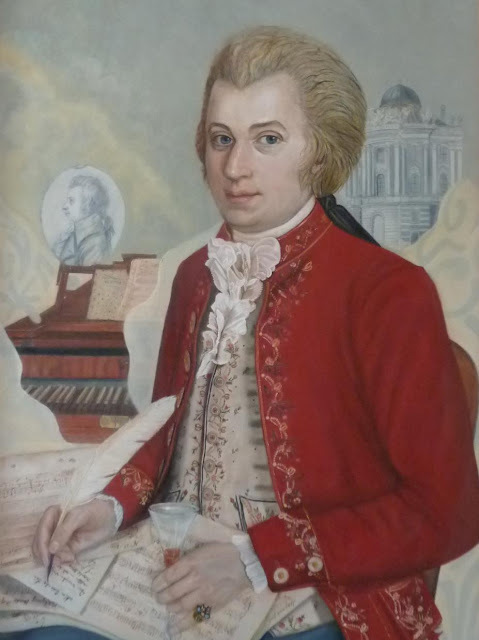 *Jose often sends me Mozart videos to share with the rest of the WolfGang, including this one! Jose's caption: Thought I'd share this one. At age 11? WOW!!! Great performance. I happened to get to know Sherry through Tom Hulce who played Mozart in Amadeus. We were fans of him and we had a sort of club on the internet with other people who admired his talent. She was told that I painted Mozart and had an exhibition called "Mozart and I" in 2006. She invited me on her site to tell my story. Ever since we've been in contact especially where Mozart is concerned. So I told her that when I was born, Mozart played for me, my mother said. I guess there was soft Mozart music playing when she delivered. Mozart has ever been in my surrounding and stretches his hands through his music out to me when I am painting, playing the piano or just doing other things or just nothing. When I am in Salzburg his spirit surrounds me everywhere. I read many books about him and love to read the books that are written in German about the Mozarts! Travel with them and so on. I never forget to visit his sister at St. Peterfriedhof and his father Leopold who lies at St. Sebastiansfriedhof together with Konstanze. In Vienna, we always travel far to visit the great Master himself. He lies there in an ocean of rest and is omnipresent! Through his music I am lifted up and gather my spirits for all things in life! 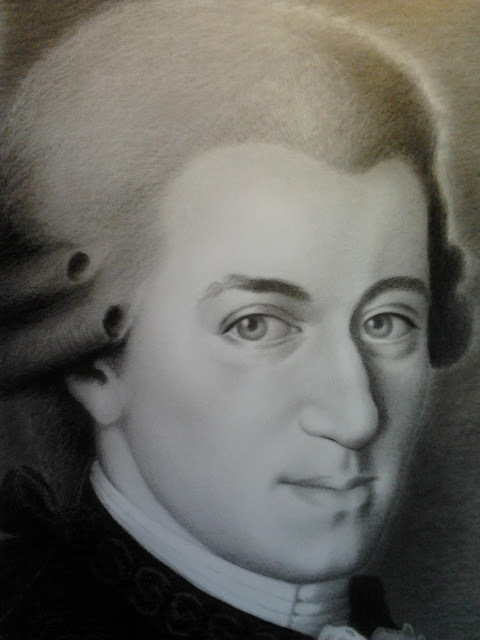 *This is one of Henryette's paintings of Mozart. Notice all of the beautiful details, including the Stock silverpoint and Vienna's Burgtheater. Immaculate! How wonderful to read about some very creative members of the WolfGang:)I am proud to have a place here! Everything looks stunning; I love the pictures and the painting(! )and everyone's so articulate that it's a pleasure to read it all. Thank you, Sherry! Thank you, Monica! The story and artwork you contributed to the WolfGang post is a wonderful example of this binding tapestry of individuals!